Fr. Gobbi has asked, with particular insistence, that his annual letter for 2008 be shared with all MMP members so that it can be “read and well meditated upon” by all. Those of you on our mailing list have already received a packet that included his letter both in English and Spanish, as well as my accompanying letter which follows. I am posting them here on our website for the benefit of those who have not officially registered as members, and also for any on our mailing list who failed to notify us of their address changes. This year’s letter focuses on unity with the Holy Father. Fr. Gobbi addresses himself especially to the clergy, stressing the necessity of following the Pope’s directives. I urge you to pay close attention to what Fr. Gobbi is telling us, and to meditate upon and heed his words – they are truly prophetic. He speaks of the dire circumstances in the Church which, as he puts it, is in a state of “interior laceration and profound suffering.” Much prayer is needed, but we have the assurance that the gates of hell will never prevail against it. In fact, the “resurrected” Church will be more beautiful than ever! “Now my plan is about to be completed. With my Marian Movement of Priests, I have called all my children to consecrate themselves to my Immaculate Heart. I have caused to spring up here, for twenty-five years now, my Marian Movement of Priests, so that the message of Fatima, often contested and rejected by many, might in your days come to its complete fulfillment. (…) Its fulfillment is necessary for the Church, so wounded and crucified, so that from its painful and bloody trial it might emerge all beautiful, without spot or wrinkle, in imitation of its heavenly Mother. Its fulfillment is necessary for all humanity, so that it may return to the arms of its Father and come to know the new times of its full communion of love and of life with its Lord and God. to go forward in his travels. Pray for him to have the necessary strength and endurance to carry out the important and urgent mission which Our Lady has entrusted to him, that of spreading her messages throughout the world. This year’s retreat will be held from June 22 – June 28, again at the Shrine of Merciful Love in Collevalenza. The spiritual exercises are open to bishops, priests, deacons and seminarians. Anyone who is interested must contact me immediately for registration information. Having now reached 70 years of age, and not having the stamina to do what I could in the past, I find myself no longer capable of traveling to conduct cenacles. I have moved to our M.M.P. Branch Office in Lewiston, Maine to be close to the members of my family who are now more in need of my assistance. Rest assured, however, that the daily tasks continue to be taken care of by my staff at the National Headquarters in St. Francis. Since I am no longer in residence at the Headquarters, many have asked if I have given up the directorship or been replaced. You can be confident of the fact that I am still the National Director of the Marian Movement of Priests for the United States. The only difference is that I am now working in another location, and calls are being forwarded to me. I plan to continue in that capacity, with all the various duties it entails, as long as God gives me the strength. At last year’s international retreat, Fr. Gobbi did name another priest to be of assistance to me in spreading the MMP in the United States. Fr. 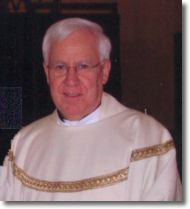 Charles Becker, of the Archdiocese of Chicago, is available to accept your invitations to conduct cenacles around the country. If interested in hosting Father, please call him directly at his residence – Tel. (815) 385-1575. Keep in mind that he is often away. If there is no answer, please leave a message and he will get back to you at his earliest convenience. We ask that those who are interested in hosting Fr. Becker help to defray his travel expenses. With our current supply of books almost depleted, we are anticipating a reprint of our 18th edition in 2008. Our Lady continues to spread her Marian Movement of Priests throughout the world in a remarkable way. You will note that Fr. Gobbi has included the Democratic Republic of Congo, Benin and Rwanda in his 2008 itinerary. There has been a great demand for the book in Africa. Fr. Pierre Diallo, the very active National Director in Burkina-Faso, ardently desires that Our Lady’s book be widely distributed among the French-speaking countries of Africa. For this to be possible, however, he needs assistance in getting the books printed in his own language. Trusting that Our Lady will provide the financial means necessary to make this a reality, we have promised to do what we can to help. Your prayers for the successful completion of these printing projects would be greatly appreciated. I am pleased to announce that an electronic concordance for the book, “To the Priests, Our Lady’s Beloved Sons,” will soon be available. We owe a debt of gratitude to a faithful member of the MMP, who donated his time and expertise in bringing this project to fruition. May Our Lady abundantly reward him. Many of you will be delighted to know that this program will give you access to the entire book. The search engine allows you to locate any combination of words and phrases, and also to browse messages on-screen by message number. The suggested donation is $15 each, payable in advance. We plan to duplicate the CD’s only when we have a general idea of how many we need to order, based on your requests. For this reason, we ask that you allow 4-5 months for delivery. The concordance was compiled and tested on a Windows XP computer. Please be advised that some of the program’s features, namely exporting data to the clipboard, may not function on older versions of Windows. Further tests have determined this function to be supported by Windows 2000, Millennium and Vista, but not by Windows 98 and prior versions. For those without a computer, we still have copies of the previous concordance which was first printed in book format in 1999. We suggest a $5 donation per copy. I am grateful to all of you for your continued prayerful and financial support. Your donations continue to sustain our work of printing and disseminating Our Lady’s messages. I also take the opportunity to thank you for your Christmas cards and good wishes. May Our Lady abundantly reward your generosity of heart. I extend a very special thank you to those who have named the Marian Movement of Priests as a beneficiary in their wills and trusts. If any of you are interested in doing the same, please call us and we will provide you with our Tax I.D. number. We are recognized by the IRS as an organization described in section 501(c) (3) of the Internal Revenue Code; therefore, your gifts are tax deductible. In closing, I wish to make an urgent appeal. As the world is sinking deeper and deeper into the mire of sin, many are abandoning their religious beliefs and practices. In short, the world is not ready to receive Jesus when He returns. Would any of you consider having the Holy Sacrifice of the Mass offered to obtain the grace of a sincere repentance and a universal pardon from God the Father to pave the way for his Son’s glorious return? Please give it some serious consideration. IMPORTANT: Please continue to send your donations, orders for publications and any other requests to our National Headquarters in St. Francis. will take advantage of this penitential season to come closer to the Lord. Following the commercial hustle and bustle of the Christmas season, it behooves all of us to realize that the days which the Church gives us to prepare for Christmas and Easter – Advent and Lent, respectively – should be ones of prayer and fasting. DO NOT allow yourselves to be caught up in the frivolities and seductions of a world which is passing away. Be concerned rather with your interior temple, where the indwelling Holy Spirit resides. May the Risen Lord pour out his abundant blessings upon you!